In each year, countless cryptocurrency were stolen by hackers or others, and it is a very significant factor that slow down the development of cryptocurrency. As a new part of investment and money management, security of cryptocurrency is increasing in importance. Although there are a lot of encryptions in cryptocurrency, wallet and exchange accounts still have a huge risk of being stolen. In recent years, cryptocurrency exchanges suffered many attacks. January,2018, lots of New Economy Movement(NEM) which worth 58 billion yen (about 530 million dollars) in the Coincheck of a Japanese exchange went missing due to illegal access. 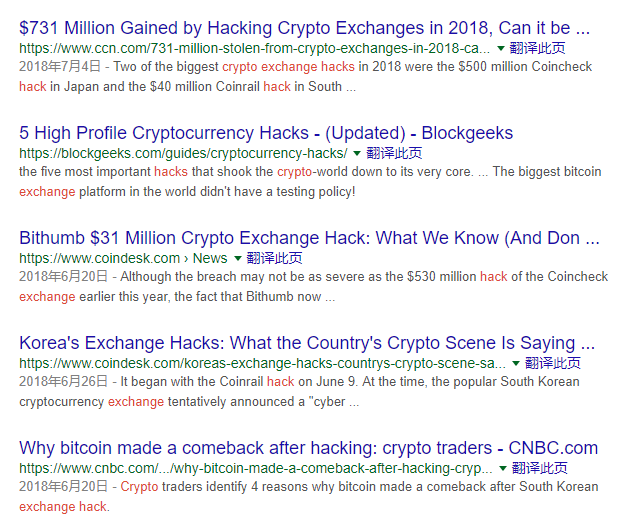 June, 2018. the Korean exchange bithumb was attacked when it moved funds to a cold account, cryptocurrency worth $30 million dollar were lost. July 2018, a loophole in the Smart Contract of Bancor resulted in the loss of more than $12 million in digital currency. Hacker attack event happens frequently. After each hacking incident, FUD(Fear, uncertain, doubt) follow. It feels like your exchange account is naked on the Internet. Decentralization of cryptocurrency make that no matter profit or loss, nobody would be responsible for that except the user self. When attack incidents rise,there is no way to find someone to take responsibility. In that case, users are weak and it is almost impossible for users to take back their lost cryptocurrency. However, there is no insurance in market for cryptocurrency trader to protect their accounts. 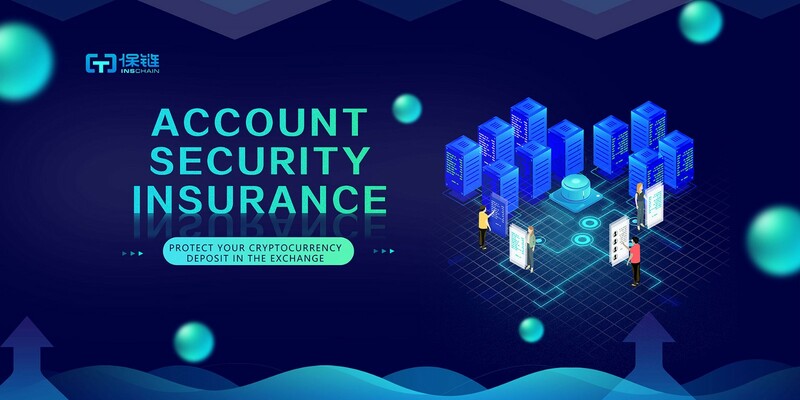 But don’t worry, to protect the exchange account of users, insChain has released its exchange account security insurance! Not only attacks from hacker, this insurance also covered the loss caused by physical invaded and employee fraud, More than that, first in market, we add transaction address input incorrectness and withdrawal delay in the coverage. InsChain would give you a full-covered account. Protection for transaction address input incorrectness. When people use PayPal or debit card to transact money, system would send a confirmation about the receiver’s name to avoid the possibility of transaction to wrong person. People could not verify the receiver by wallet address when transact cryptocurrency since the feature of anonymity of cryptocurrency. Mistakes of one number or letter are very difficult to find too. As above said, it can not be taken back once the incorrect transaction happened. If the insurant input a incorrect address when use their account to send or receive any cryptocurrency equivalent to more than 0.5 ETH, and the incorrect address only has one letter different from real address, we would pay 10% of total amount of cryptocurrency in this transaction which not more than 1000 CNY. When claim the settlement, insurant need to provide address certificate from exchange, proof of address ownership and the screenshot of transaction to incorrect address. Our team would found a investigation group to look into this incident. After insurant submit complete materials, an conclusion would be formed within 30 days. Withdrawal delay maybe not a big deal, but it may ruin a important deal. When withdrawal delay happen, user would show dissatisfied at first, and then panic rise, everybody would begin to worry that exchange would stole their property. Account security insurance of insChain could help you with that too. If the insurant transact cryptocurrency equivalent to more than 0.5 ETH from his/her AEX account during the period of insurance, and there is a delay more than 72 hours, we would pay the insurant 10% of the total amount of this transaction as compensation. 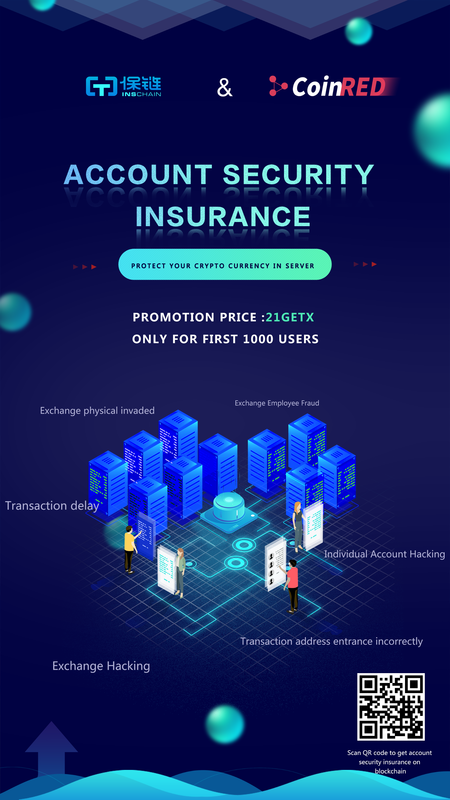 The unique design of insChain, account security insurance has been launched on CoinRED.pro already. As the first asset allocation exchange, CoinRED combine insurance with transaction together to build top user experience. And you could get 20 GETX for each new users register through your invitation links.